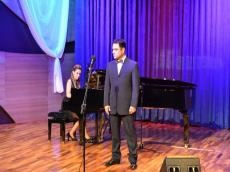 International Mugham Center hosted an event in memory of acclaimed opera singer Adil Melikov on October 12. Addressing the event, Hafiz Guliyev, director of the Azerbaijan State Academic Opera and Ballet Theater, told a story about artist's life and creativity. People's Artist of Azerbaijan Garina Kerimov, honored artists Gulnaz Ismayilova, Zemfira Ismayilova, Inara Babayeva, Ilakha Efendiyeva, Sabina Vahabzadeh, Aliakhmed Ibragimov, Jahangir Gurbanov, Afag Abbasova, Saida Sharifullayeva, Nargiz Karimova, Farid Aliyev, Anton Gerstandt, singers Nina Markova and Taleh Yakhyayev took part in the concert, organized by TV channel "M?d?niyy?t" (Culture), Trend Life reported. The audience was represented by works of Azerbaijani and world classics - Uzeyir Hajibeyli, Muslim Magomayev (senior), Fikret Amirov, Giuseppe Verdi, Georges Bizet, Giacomo Puccini, Antonin Dvorak, Reingold Gliere and others. Over 40 years, Azerbaijan's Honored Artist Adil Melikov (lyricist-dramatic tenor) performed on the stage of the State Academic Opera and Ballet Theater. He created a number of bright images such plays as "Koroglu", "Deceived Stars", "Rock of the Bride", "Fate of the Khanende", etc.